The first puck was struck in the new NHL season on Oct. 7, and as usual enthusiasts of Russian hockey will be well catered for, with the NHL’s contingent of Russian stars providing plenty of talking points. RBTH asks five key questions about how Russia’s leading NHL players will perform this year. Which new record will Ovechkin set for Washington? Last season Alexander Ovechkin became the best sniper in the Washington Capitals' history, beating Slovak Peter Bondra's 10-year-long record. This record is already Ovechkin's eighth in a Washington jersey and in the future the forward has even more objectives. 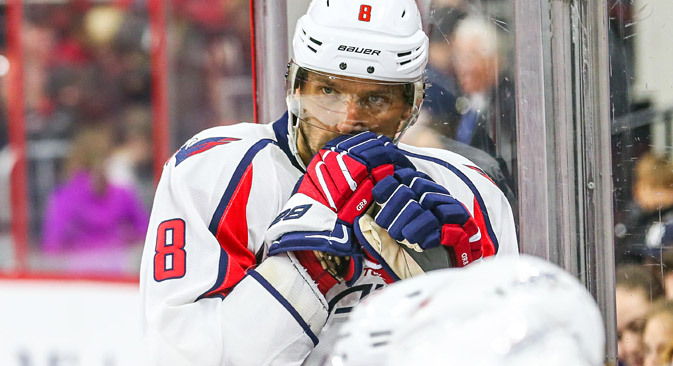 “Ovi” will try to beat Bondra's hat-trick record (19-16 in the Slovak's favor), the record of goals in even-strength play (303-286 in Bondra's favor), Dennis Maruk's record for number of points in a single season (136-112 in the Canadian's favor) and most importantly, Dale Hunter's record for playoff points (72-70). It will not be easy, however. Ovechkin's teammate Nicklas Backstrom's injury was a big blow for the team. To make it to the playoffs Washington will need new feats from "Alexander the Great." Can Nikita Kucherov keep firing on all cylinders at Tampa? Every seventh shot hit by Kucherov last season made it into the net – the best shooting performance in the NHL. In total the Tampa Bay Lightning forward scored 65 points and became the find of the 2014-15 season. The new season has high expectations for Kucherov: The authoritative Yahoo! Sports portal has ranked him 8th on the league's top 10 forwards list, while Tampa's coach Jon Cooper has promised to give the Russian more playing time. Fans and specialists have the right to believe that Kucherov will continue his super series. Will Vladimir Tarasenko's fourth year live up to its promise? Analysts usually highlight two determining moments in a player's career: the second year, which is considered the most difficult, and the fourth year, which is considered the most productive. On the eve of his fourth year Vladimir Tarasenko signed an 8-year contract with the St. Louis Blues for $60 million. Obviously he is expected to yield results immediately. Moreover, with the departure of right winger T. J. Oschie, Tarasenko will likely receive more playing time and thus be able to position himself as the team's leading player. Will Artemi Panarin secure a position among the NHL's reigning champions? Last season forward Artemi Panarin demonstrated remarkable skill with the Russian champions, St. Petersburg’s SKA. Achieving success in Russia, he then went on to conquer the NHL, where his Chicago Blackhawks teammates praised his technique, showering him with compliments. However, Panarin is not expected to yield sensational results. Just like Tarasenko, he will need time to adjust to the NHL way of playing and to his new team's style. In recent seasons no one from the Hawks has been able to score even 80 points per season, meaning there is a certain something lacking in the lineup. Will 33-year-old Evgeny Medvedev get used to playing with Philadelphia? Philadelphia Flyers’ Russian defenseman Medvedev showed the best of himself in the preseason matches, confirming his right to play in the starting lineup. Fans who in the summer were surprised by the appearance of the 33-year-old player from the KHL are now ready to give Medvedev their full support. Specialists believe that the Flyers have not had a defenseman with such a powerful shot for a long time. Philadelphia has hired an English teacher for Medvedev, who works with him three days a week. The player is already making significant progress. "His English is way better than my Russian," joked Flyers' goalkeeper Steve Mason.